Phoenix Class War Council's Beer and Revolution returns from a brief hiatus this Sunday. We are pleased to announce this month's installment of B&R will be hosted by our friend and comrade, Crudo, from the Modesto Anarcho Crew (MAC). Our last B&R in September was a roundtable discussion on Borders & Movement, 30 people attended, including perspectives from CAROB (Central Arizona Radicals Opposing Borders) and the O'odham Solidarity Across Borders Collective. While we've been very busy, we are glad to know that anarchists and anti-authoritarians in the Valley enjoy participating in a political night, and we will try to continue scheduling a monthly night for speakers and discussion. We find a lot of value in this event, especially as we look for fractures or fissures in our daily lives, and by making a traditionally non-political space (a bar) a temporary political space where liberatory ideas can be discussed openly. We hope projects like B&R inspire others to look for unconventional approaches to challenging the banality and misery of life in modern class society. We also find inspiration in the projects of our insurrectional pals from California's central valley. The folks from MAC are busy as hell, giving it a go at building unconventional alliances amongst the discontented and marginalized, from hip hop shows against the recent gang injunctions, to supporting the efforts of the local needle exchange (a harm reduction effort for Modesto's poorer needle users that has seen it's members under attack by the police, please read more here), intervening in local struggles against education fee hikes and the nurses strike, publishing the quarterly Modesto Anarcho paper and Crudo's Vengeance journal and blog, and operating an impressive anarchist social center"Firehouse 51." 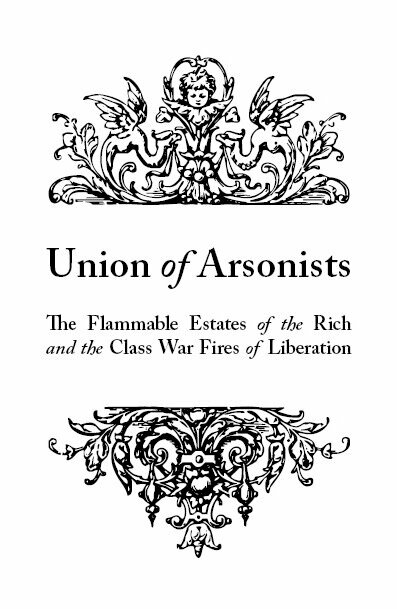 With a higher poverty level than the rest of the state (which is itself a sinking ship these days), Modesto, and other Central Valley anarchists, have their work cut out for them. Come out this Sunday for some delicious beers, or perhaps a soda or water for non-drinkers, and some great political discussion, critique, thought, and debate. We wouldn't have it any other way! 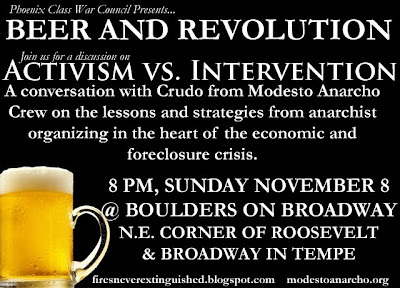 The November gathering of Beer & Revolution will once again be held this Sunday, November 8th at Boulders on Broadway in Tempe. The night begins at 8PM, and Crudo will begin his talk at 8:30, come out and have some tasty drinks, meet and mingle with other like minded people, and enjoy another great political social night. See you there!